The Northern Regional Security Council (REGSEC) has banned all outdoor political activities in the Tamale municipality. This followed clashes between some supporters of the New Patriotic Party (NPP) and the National Democratic Congress (NDC) at Tamale on Sunday during which 15 people sustained various degrees of injury, including gun-shot wounds. The clashes occurred at Lamasheku, where the NDC supporters were going through a flag-raising ceremony and at Zogbeli, where the NPP was commissioning a campaign team.Apart from the injuries, a number of sheds of the two parties were burnt down.Almost all the injured have been treated and discharged by the Tamale Teaching Hospital. No arrests have been made yet and a joint military and police team has intensified patrols of the metropolis to ensure law and order.The Northern Regional Chairman of the NDC, Alhaji Suleimana Gado and his NPP counterpart, Alhaji Abdul-Rahman Salifu , blamed each other's followers for perpetrating the violence. According to Alhaji Salifu, a lady cripple and sympathiser of NPP, who was on her way to witness the party's inaugural ceremony was allegedly assaulted by NDC supporters.He said when he was later informed that the NDC supporters were coming to attack them at the ceremony grounds, he asked that the ceremony be put off to enable the people to disperse peacefully to their homes. 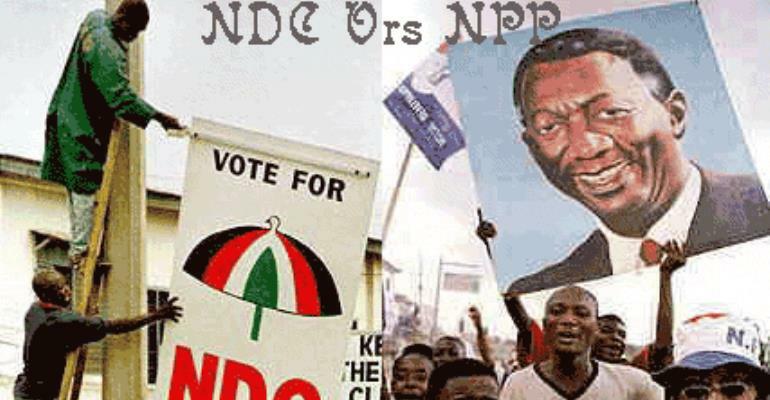 According to the chairman, on their way home after 6 p.m., NDC followers allegedly attacked some of the NPP supporters at various locations.He said they also destroyed NPP flags and later burned down an NPP shed at the Old Cemetery Road Junction along the hospital road in the wee hours of yesterday. Alhaji Salifu blamed the situation on some alleged “chieftaincy contractors” in the metropolis, who were bent on playing politics with the unfortunate Yendi crisis to achieve their selfish interest.On his part Alhaji Gado, said when their ceremony was at its peak, an NDC supporter, who was bleeding from the head reported that he had been assaulted by an NPP supporter. He further claimed that some NPP supporters had mounted a barrier at Zogbeli, where they attacked anybody who approached the area in NDC insignia.Alhaji Gado also alleged that some NDC sheds at Poloya-Fong, a suburb of Tamale, were destroyed while a motorbike with registration number NR 172 T, belonging to Issahaq Harruna, was also damaged in the process. Both chairmen have, however, appealed to their supporters to exercise restraint in the face of any provocation. The Tamale Divisional Commander of Police, Superintendent Alexander A. Adjei, entreated the people to always cooperate with the security agencies by volunteering information. He warned that the police would not deal leniently with any individual or group of persons who would want to disturb the fragile peace in the area.